While the team here at Knox Carpets tends to geek out and be extra excited when it comes to carpet trivia, that doesn’t mean that it can’t excite our blog readers and customers as well. The idea itself has such a storied history, one can’t help asking questions or wondering about certain evolutions of the carpet and other flooring solutions. We know that flooring solutions, and carpet in general came from very humbled beginnings. So humble in fact that we relied on Mother Nature for them. But times have swiftly changed and now luxury real estate may even take advantage of rare and delicate furs when choosing materials for different flooring solutions. It should come as no surprise that one of the most famous carpets looking back in history, is one that is most frequently used for very important or very famous feet. We’re referring of course, to the red carpet. It has piqued many a question in the minds of our team members and customers alike. Why is it red? Why is it shaped like that? Who decided it must be so? Time to put those questions to rest and get you the answers that you need. By dictionary definition, a red carpet has been traditionally used to mark the path that is about to be taken by different heads of state. It’s used for both ceremonial and formal occasions. It’s only in more recent decades (really the 1930s and onward), that such a courtesy has been extended to everyone from celebrities in Hollywood to executives at company celebrations. 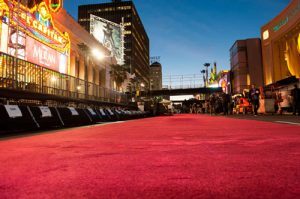 The earliest red carpet has storied roots—dating all the way back to the plan Agamemnon by Aeschylus, which was written in the year 458 BC. The character Agamemnon has just returned from Troy and is greeted by his wife (who turns out to be quite vengeful) with a red carpet. She says, “Now my beloved, step down from your chariot, and let not your foot, my lord, touch the Earth. Servants, let there be spread before the house he never expected to see, where Justice leads him, a crimson path.” Sounds a bit dark and morbid, doesn’t it? Today, they’ve come full circle as both functional and formal. You’ll see red carpets at all sorts of events including those for music, theater and art. They make sense as an entry way for stars, with opportunities for the paparazzi and fans to flank either side, while not obstructing anyone’s path. So there you have it. A brief history of the infamous red carpet. What other fun trivia have we got up our sleeves? You’ll just have to keep coming back to find out!